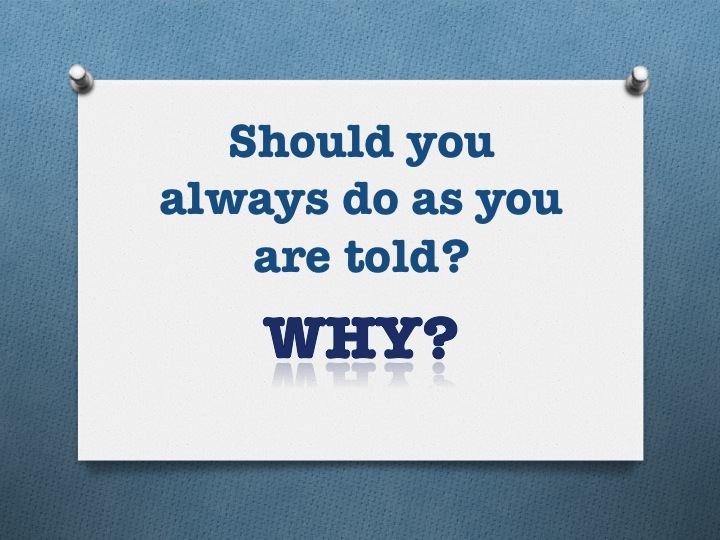 Thought for the Week: Should you always do as you are told? Previous Post Urgent Message about Parents Evening! Mia says yes, otherwise you will get into trouble, detention or suspended , except if you know your right. I quite agree! You need to always evaluate the situation and what it is that the person is telling you to do. You also need to think about the context. Your example illustrates this beautifully, thank you. I think you should not always do as you are told because the person you are talking to could be lying. I think you should only sometimes listen to people because they can tell you to do the rong thing like jump out of the window. You should only listen to people you know. I think you shouldn’t always do as your told because if someone told you to kill someone, you know you wouldn’t do it. Also I think you should follow your consions and decide for yourself. But when it comes to doing what your teacher tells you to and your parents, it’s a must (even though we don’t alway listen ). I agree with you Eden, like the last time me and my mum walked home from school, we were about to miss the bus so I ran quickly to stop it even though my mum told me it was to late and it would go. Luckily, the bus driver saw me and stopped and waited for us. If I hadn’t of ran, it would have probably gone. So don’t always do everything people say!! I disagree because what if that person you know tells you to do something wrong and you do it . I think that we should listen to the people that we know because if your sister said please can you eat your food you could do that. That is good. please comment. I dont think you should always listen to what you have been told because if someone tells you to jump of a cliff or kill someone I am sure you wont do that.